Kate in the Kitchen — a few of my favorite things…. 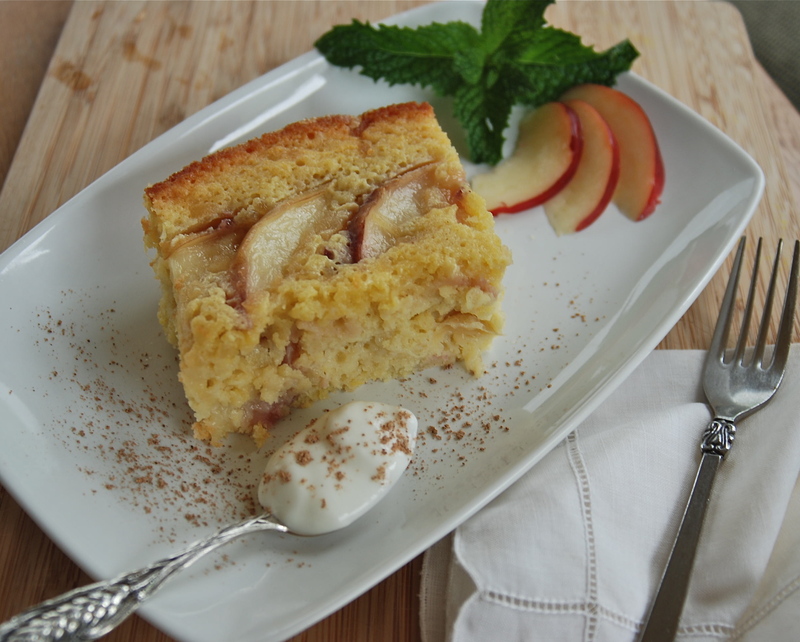 I’m just slipping in here to show you a few of my previous posts for wonderful Spring recipes now that our season has really taken off. It’s green, flowering, rainy, then sunny, and now, finally it’s getting warm. One benefit of having a food blog for almost 8 years is the huge Recipe file filled with so many luscious treats. There are a lot of great options for Spring, and instead of having to peruse the Recipes and decide for yourself, I’ll share some of my favorites from Spring seasons past. 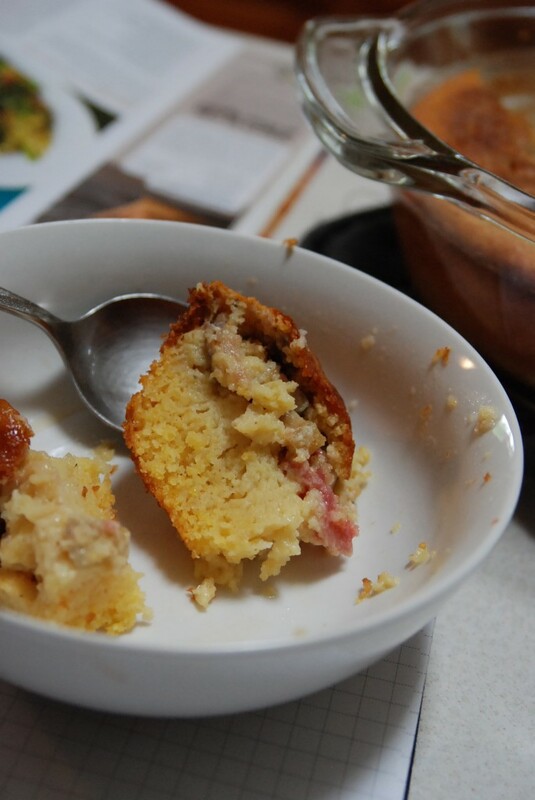 Almost two years ago to the day, this wonderful Rhubarb Spoon-Bread graced my kitchen. It was dreamy and creamy, tender and delicious. The downside was that I was the only one who liked it so I haven’t made it again, but I hope someone else can enjoy this delectable treat. Ever roasted radishes?? You’ll love how the peppery bite is mellowed with the heat. 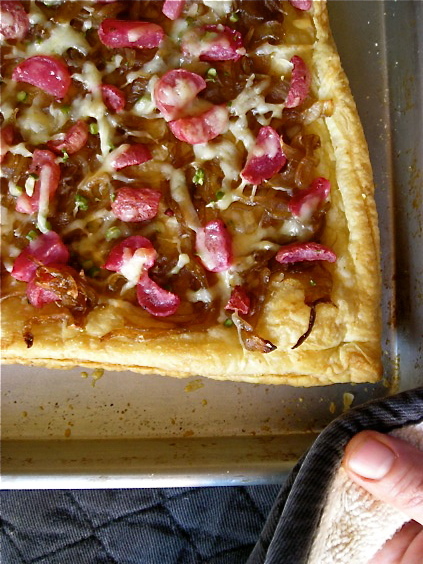 This Roasted Radish & Caramelized Onion Tart is light and fresh tasting. 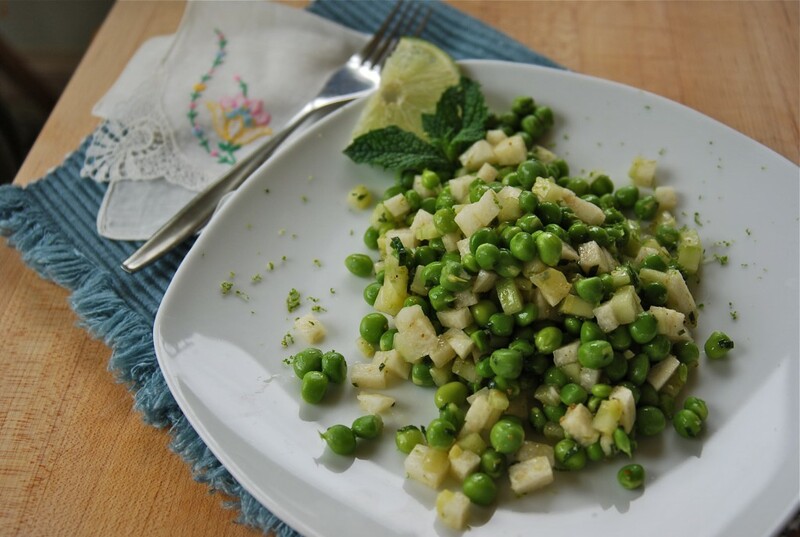 One of my most favorite, and often repeated salads every Spring is this Raw Pea Salad with Jicama, Cucumber & Mint. It satisfies one’s need for crunch, freshness and flavor all in one bite. Looking for something different to do with your strawberries? 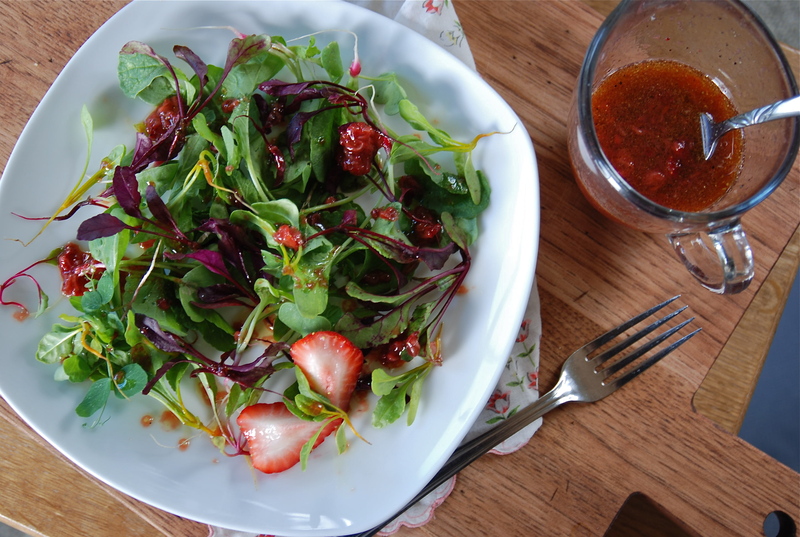 Make a delightful and simple Strawberry Vinaigrette to dress your freshest of Spring greenery. Apricots are one of the sweetest, and most fleeting of the stone fruits, with a season that is so quick you can miss out if not careful. 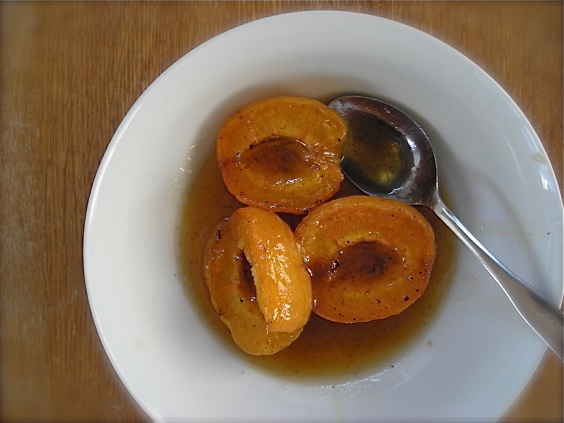 A fresh apricot, tender and juicy is a delight all on it’s own, but these Roasted Apricots in Cardamom Brown Sugar Glaze are an amazing and buttery treat you won’t want to miss. While it’s not quite yet Nectarine season, you can find some awfully good ones in the markets if you know where to look. I love this easy and light Ginger Nectarine Cake for showcasing yet another of the finest stone fruits. For a warm weather option, I love a good salad with a different twist from the standard lettuce and veggies. 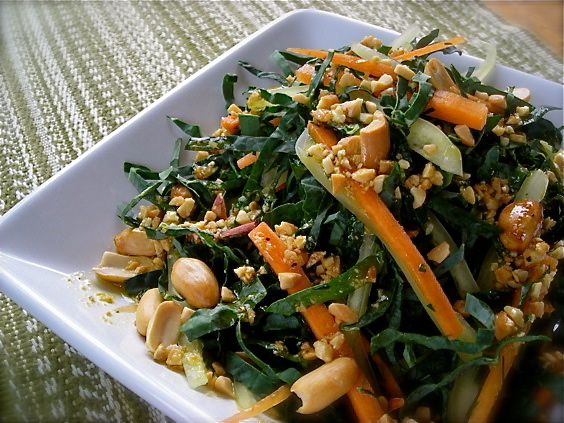 This Kale Slaw with Peanut Dressing is one of my favorites styles, and I’ve been making a variation of it regularly since it’s first creation in 2011. Mark Bittman’s 101 Simple Salads for the Season and Summer Express: 101 Simple Meals Ready in 10 Minutes or Less. I love these photos Kate, they are beautiful! Beautiful! Thanks for the summer cooking inspiration.